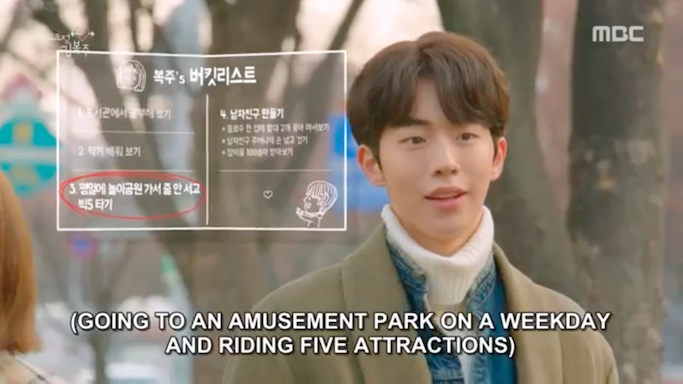 Anagon's Bucket List: Daegu's E-World Theme Park aka Weightlifting Fairy Kim Bok Joo's Shooting Location! 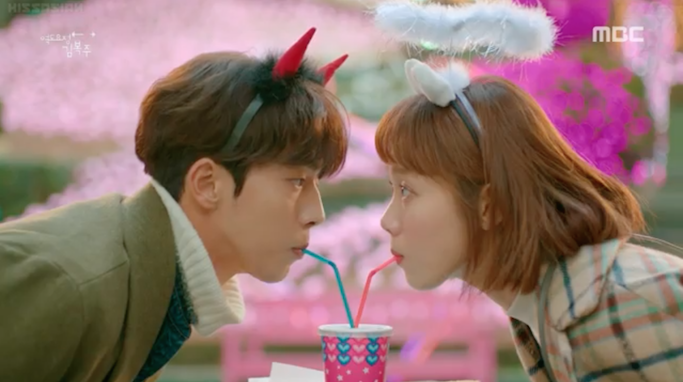 I think no other scene in this wonderful world of Korean drama made my heart flutter as much as Weightlifting Fairy Kim Bok Joo's theme park episode when Joon-hyung fulfilled Kim Bok Joo's secret bucket list. 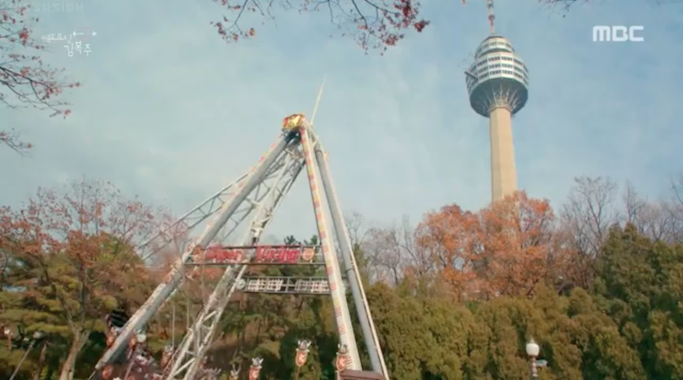 Anagon's Bucket List #1: Go To E-World Amusement Park in Daegu! 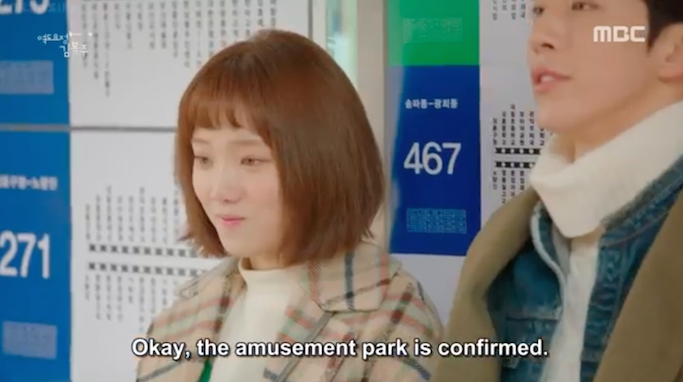 During the whole Weightlifting Fairy craze, I was searching for the theme park shooting location and thought all along that it's just in Seoul. 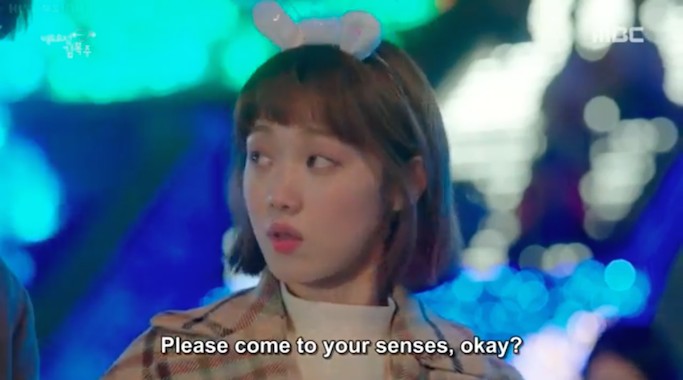 Naisip ko pa nga, is there even a theme park near Myeongdong, near the Namsan Tower? Thank God information on the internet is so fast, and so I found out right away that this theme park is not anywhere near Seoul, but in Daegu! Fast forward to 2018, nung nag paplan na ako that I am going to Daegu for spring, top of my list is to finally visit E-World! Ang galing nya stumyle! Haha! To me, everything seems so perfect, how the story was built to lead to this scenario and location. 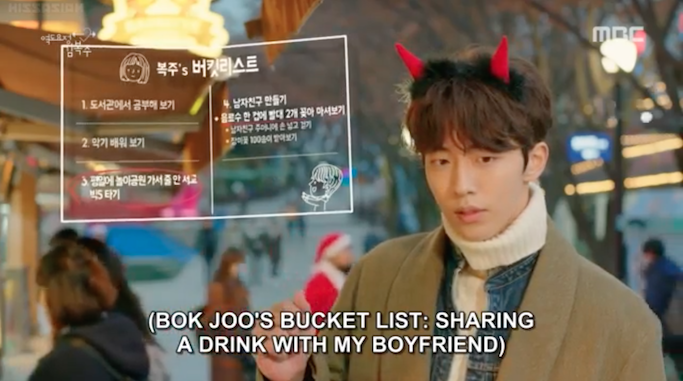 Joon-hyung wanted to get Bok Joo's attention, and so when he saw her secret bucket list, he ticked them all one by one in a non-cringey and cute high school love kind of way--including going to the theme park! 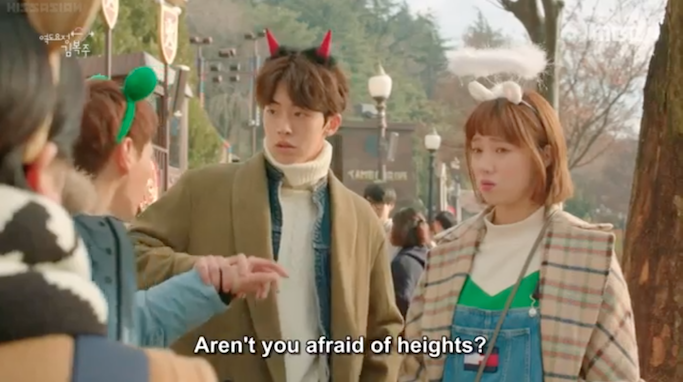 Even though he is afraid of heights, pinush nya talaga ang rides lalo na nung walang gustong sumama kay Bok Joo! Haha! 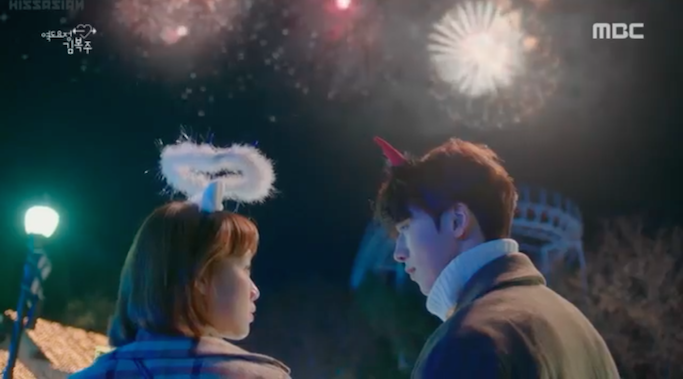 But I think one of my favorite parts was when Joon-hyung tried to hold Bok Joo's hands while they watched the beautiful fireworks at night along with the crowd, knowing that one of Bok Joo's biggest insecurities is having rough hands for being an athlete / weightlifter. 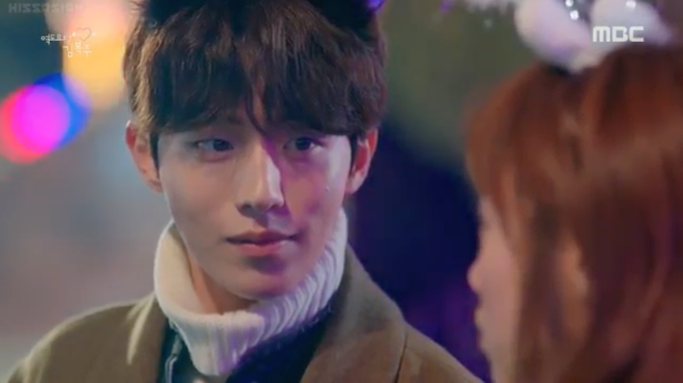 But you will feel Joon-hyung's sincerity as he still held on while staring at her, wearing that cute boyish smile. HAY KILIG NA KILIG PARIN PALA KO #%^@! Hahahahah! 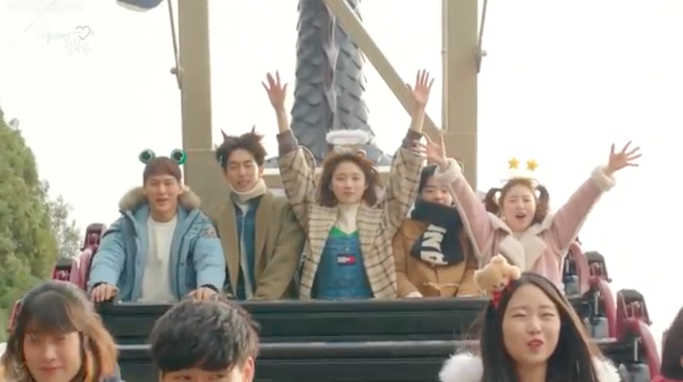 Anyway, imagine my excitement as I walked with the crowd (mostly couples haha) while entering E-World theme park in Daegu, the location for Weightlifting Fairy Kim Bok Joo's Episode 12 (di ko yan memorize a, Ginoogle ko muna lol)! I didn't know I'll be actually going here this soon!! Straight from my KTX train ride from Seoul, I decided to make the most of my first afternoon in Daegu by going to E-World right after checking in my guest house. Sobrang excited ko ba so nawala din ang pagod haha! May nabasa din ako online na it's better to go to E-World at night since may discount na ang tickets, plus malapit na mag fireworks. I bought my ticket on the spot, and maikli lang naman ang line. I wasn't able to pre-book discounted tickets online, so I guess okay nadin na dun na bumili. If you want to buy online or just check the rates, go to this link. I think I arrived at around past 5pm na, so naabutan ko pa na daytime, then sunset, and of course E-World at night where everything's bright and colorful with all the lights. Yeppuda! Anagon's Bucket List #2: Get a cutesy theme park appropriate headband! The moment I entered the theme park, sakto etong store nato ang bumungad sakin! 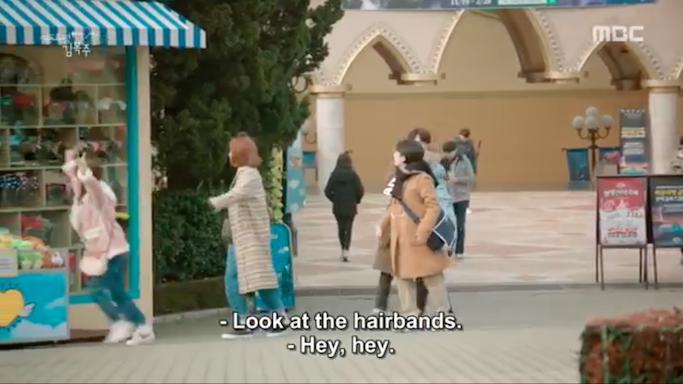 Naiimagine ko Bok Joo's friends running fast inside to get their hairbands!! I haven't rewatched this series for this trip, but everything's suddenly familiar! 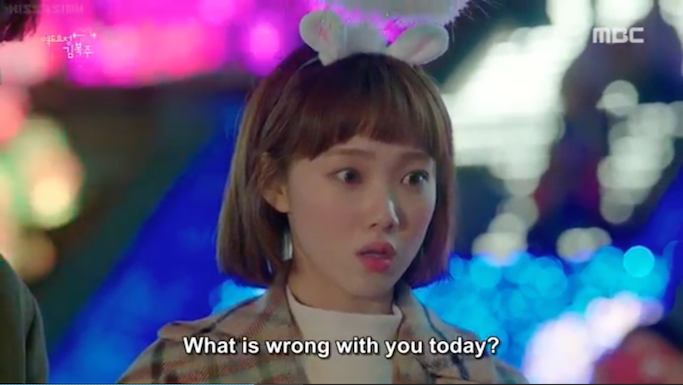 Sadly they don't have any of the white angel headband that Bok Joo chose (baka planted na yun for the series hehehe) and so I settled for this pink one and walked around the theme park wearing it! What I love about going to Korean theme parks = wala silang pake, haha! 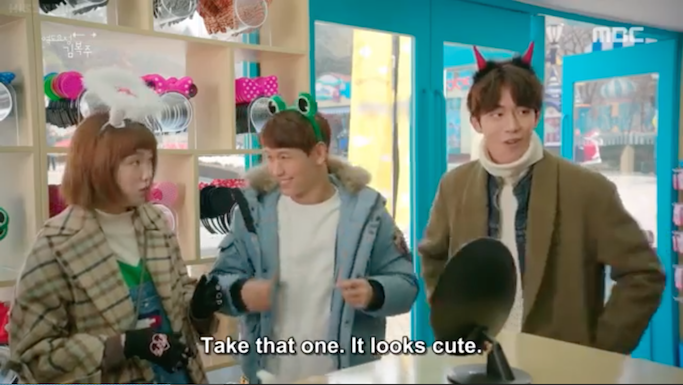 Even Joon-hyung's devil headband is not available! 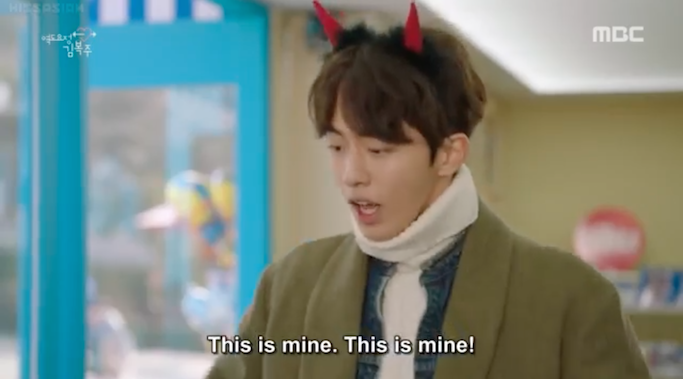 Ahhhh I love this scene so much, tawang tawa padin ako! Sakto naman, I am always in my athleisure wear whenever I have to travel (planes, long train rides)! SWEG na ba!? Hahaha! Anagon's Bucket List #3: Check out the extreme rides featured in the series! Self discovery during solo travels = I LOVE RIDES but I haven't tried riding one when I am alone! Huhu! Either I enjoy the experience more kung may kasigawan, or nakakainip naman pumila mag isa haha! And so I was just satisfied checking out the extreme rides at a distance. Tawang tawa din ako sa Vikings scene nato that I almost risked it and lined up to try it, hahaha! 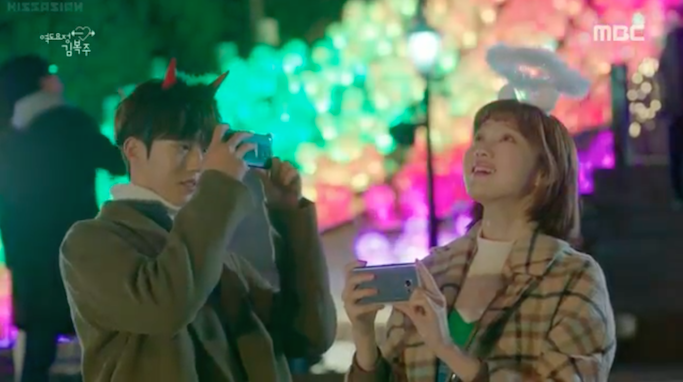 I can relate kay Bok Joo and her poses coz I love this ride so much! Anagon's Bucket List #4: OF COURSE.... CHURROS! If I am not going to any rides, then what else is there to do in a theme park than EAT theme park foods!?? I walked and walked searching for a churros food stall in E-World. Was able to see gardens and funny kids playing by the water fountain during my stroll. 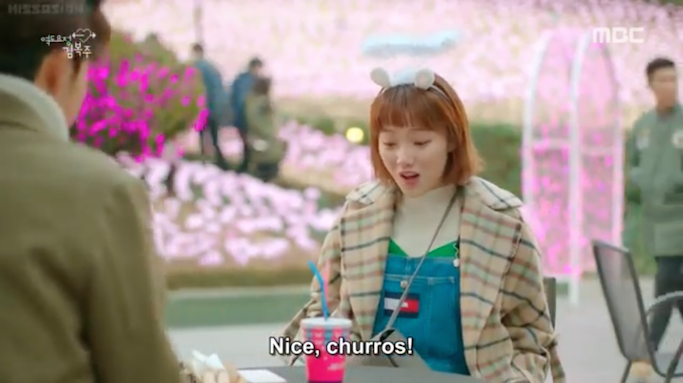 Finally... And in Kim Bok Joo's voice: CHURROOOOS! Ordered a stick and it's SO SO GOOD! I love Korean churros, ang sugary niya and the bread is crunchy outside, soft on the inside. Yum yum! Di pa ako busog lol, I also got grilled corn and even popcorn, haha! 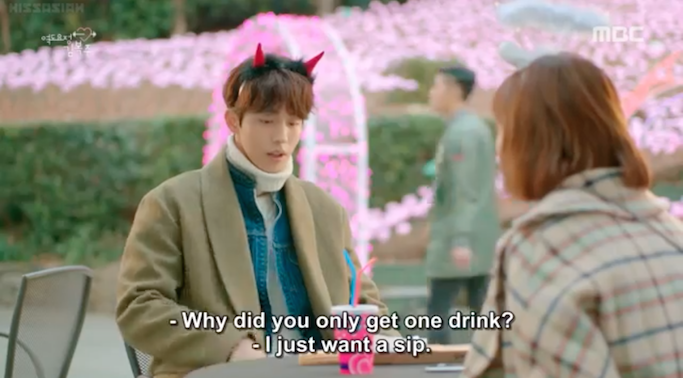 Sayang I did not see the exact pink and blue cup of soda in the series. Again, baka planted nadin yun! Found the exact same spot in one of the most beautiful scenes in a Kdrama ever! (for me, okay! 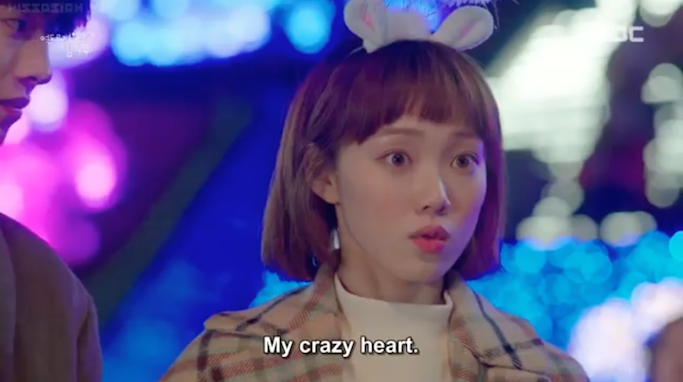 big fan e, hahaha) 💘💘💘 (((Insert the chorus of Dream by Han Hee Jung from WFKBJ's OST!))) I was silently shrieking while taking this picture hahaha! 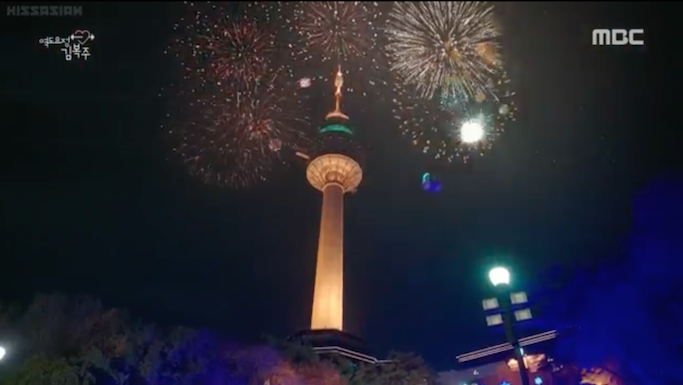 Anagon's Bucket List #5: See the fireworks of E-World! By nighttime, it started to get cold so I decided to go inside the 83 Tower to see the view of the city while in a heated indoor venue. I added I think 5000KRW to enter since I wasn't able to buy the pass with my entrance ticket earlier. Near the tower and inside the tower are beautiful, lighted installations. Koreans are into aesthetics and photo ops! They take lots of pics, so hindi nakaka hiya mag set ng timer or mag selfie. I was resting by the door of E-World's 83 Tower after all the walks, when I heard it. Lights filled the night sky of Daegu, and people ran outside to watch! 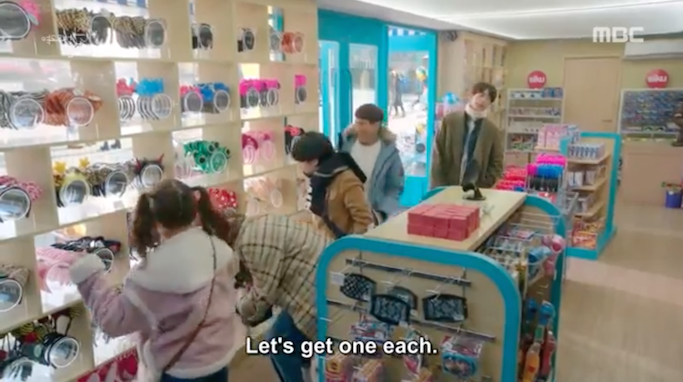 I scampered along with them when realized I am finally ticking the last item on my WFKBJ E-World bucket list! Huhuhu. 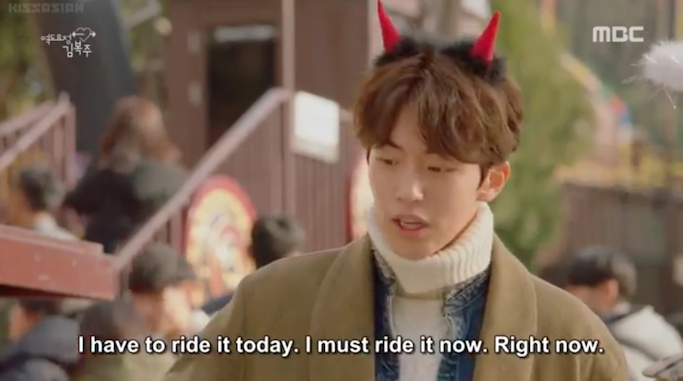 I know I don't have a Joon-hyung yet to make my dreams come true, but people will not know how much fulfilling it is if you can finally do things for yourself. The kilig came from knowing I made things happen without waiting on anyone to do it for me. I am mababaw and simple minded that way, and seeing lights and dreams happen right before my eyes made me a bit teary eyed and thankful even without a hand to hold. One day, someday. But for now, I am truly happy for what I have in front of me. I left E-World with tired, aching feet but heart filled with optimism. Thank you for the good vibes on my first night, Daegu! 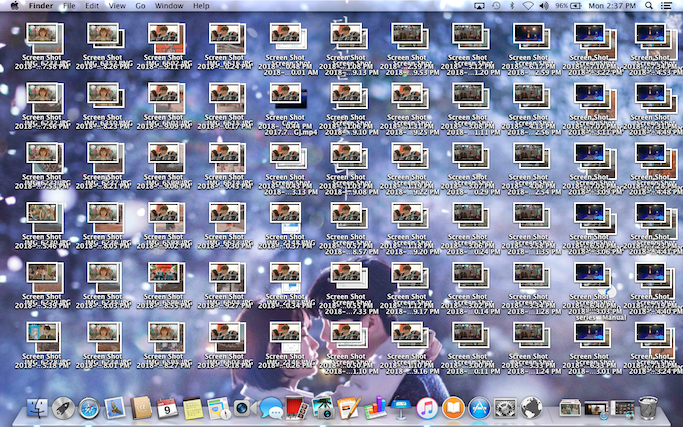 PS: Here's how my laptop looked like after re-watching Weightlifting Fairy Kim Bok Joo while writing this blog post! Hahaha! I missed this series and I know over na ang hype niya now. 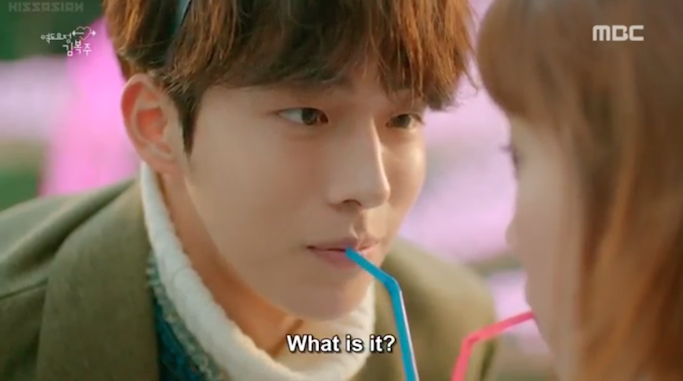 But after seeing one episode again, natatawa padin pala ako and kinikilig padin. 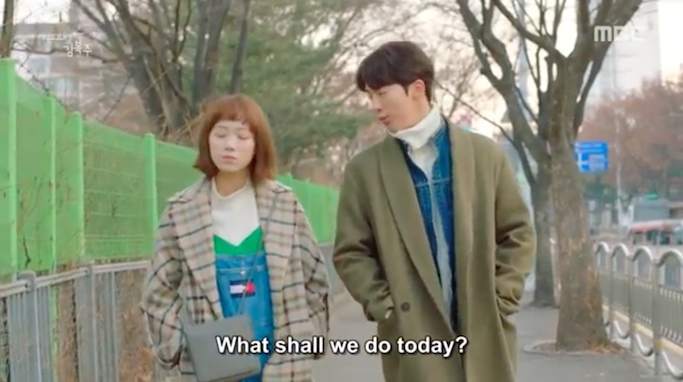 Top of the top favorite ko pala siguro talaga to because of how much I can relate to Bok Joo! E-World is located near Duryu Station (Daegu Subway Line 2), Exit 15.